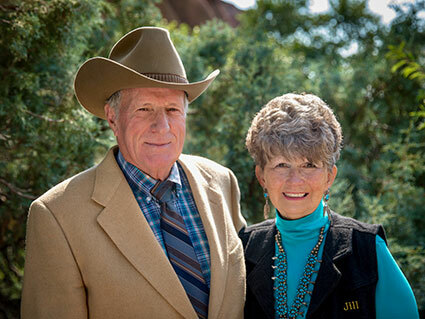 Jim and Jill Anderson of Denver are descendants of Wyoming homesteaders. Driving west on Highway 450 between Newcastle and Wright, a turn south onto Lynch Road takes you to the Converse County line – right through the Earl and Minnie Lynch Ranch. Jill Anderson’s parents built that ranch in Weston County. They were among the last homesteaders in the state, starting out at a time when others were giving up. Jim and Jill Anderson established the Earl and Minnie Lynch Agriculture Scholarship in 2015 to honor the Lynches’ determination and dedication and specifically to support students pursuing graduate degrees in the College of Agriculture and Natural Resources. Growing up, I did not go to kindergarten, I went to a one-room school house, three and a half miles away. One year there were seven of us, one year there were only three. The school had outdoor toilets and a pump for water. It was the early 1950s, and my brothers and I felt lucky to have a school. After eighth grade, I went to high school in Newcastle. For two years I boarded with a relative, but my dad missed me, so the last two years, he drove me every day the 18 miles to catch the school bus—the entire round trip was 100 miles. After graduating, I waited a year, then went down to Laramie. My dad was born in Omaha, Nebraska. His dad and Lyn Sherwin came to Wyoming, and Sherwin started a ranch on the Cheyenne River, the 4W Ranch. It borders the Lynch Ranch. My dad met my mother, but she was five years younger. Her family lived on a homestead where cowboys and travelers stopped on their way to Newcastle. She was a platinum blonde cutie with big brown eyes. He took other girls to dances, but he knew he had to wait and just let her grow up. She was 18 in 1933 when she graduated from high school and they married. My dad quit the 4W Ranch because there was no house for a married couple. My dad homesteaded in 1933. Of course, that was dryland Wyoming, and it’s hard to make a living on just one homestead. During the drought and Depression of the 1930s, a lot of homesteaders were leaving, and my dad bought more land. Now it’s been a family-owned working cattle ranch for 85 years. My parents were married 65 years. I had two brothers. Byrd was killed in an oilfield accident in 1957 when he was 22 years old. He left a wife and three little girls. My brother, Patt Lynch, and his son, Troy Lynch, and his sons, Tyler and Travis, continue on the ranch today. That’s a pretty neat legacy right there. I started in the college of ag in the ’60s and spent two years in home economics. I ended up switching to education, but while I was there, Margaret Boyd was my adviser. Doc Boyd in the geology department was my husband’s adviser. Don Boyd may never have lived on a ranch, but he is a true cowboy. And when I took Geology 101, Doc Knight taught the class. At the time, I didn’t know it was such a big deal to be taught by him. Jim was a graduate student in the geology department when we married. Our rent was $40 a month. I remember we couldn’t afford paper towels. We chose to support graduate students because we’ve been there. In addition to the Lynch Scholarship, Jim and his mother, Marie, established the Earl F. and V. Marie Anderson Endowment to support graduate students in natural resource development geology. Jim’s dad’s parents homesteaded in the early 1900s in Laramie County. His mother’s parents moved to the Chugwater area from Iowa circa 1928. Jim’s family raised Black-faced Suffolk sheep. His dad was known for his rams, which he would sell in Casper, Buffalo, and Craig, Colorado. I met Jim in Douglas at the state fair. He was showing sheep at the sheep barn. My family is cattle all the way. My dad started with Herefords. Now, my brother raises Black Angus. Consumers love the grass-fed, free-range beef. I taught 3-, 4-, and 5-year-olds for 23 years in Jefferson County, Colorado. I loved it. You teach the kids and the parents, too. You are a mentor to them. My partners and I wanted to start kids out with a positive school experience. Some who have graduated from high school still contact me. You don’t realize when it’s happening, what kind of influence you have. Does the World Need More Cowboys? My brother, Patt, is a good old cowboy. He can tell a story, and he knows a lot of Western history. I like to go up for branding and weaning. At this time, we put on quite a feed. We serve prime rib for about 30 people who come from Gillette and Casper and Colorado to help. This is just neighbors helping neighbors. Five years ago, this dryland ranch was hit by an end-of-July storm. As much as 13 inches of rain and hail fell in a very short time. It took my brother’s house, two barns, almost his life. In one place, it was 25 feet deep. Patt lost his old dog, who wouldn’t leave and got swept away. The water was so strong, but Patt was saved because he was able to grab the bed of the truck. That’s the heart of cowboy country. Jim and I feel so strongly about ranching. It’s a lifestyle. It’s not for the rich and famous. We’ve been blessed with family, friends, business, and education. You can’t ask for more than that.